Way back in January, I ran my annual “What would people like to see New on the Blog” poll and the winner, to my own shock, was a paper doll of a child. Now, I don’t like drawing children. I think I’m bad at it and also I find it a little bit boring, but I started thinking about how much I love dolls and how many of my favorite paper dolls from my childhood were paper dolls of dolls. So, I knew I couldn’t draw a “child paper doll”, but I could draw a paper doll of a child doll. After um… nearly 10 months, the Poppet Dolls are now here. 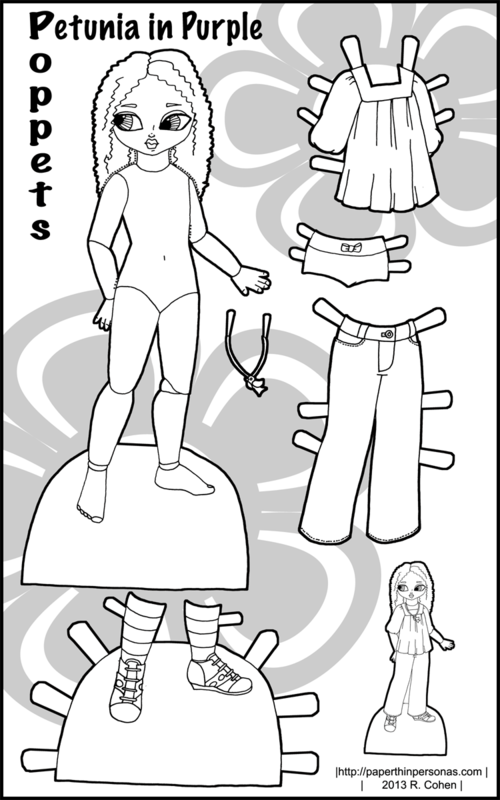 A few quick facts about the Poppets, they are smaller than most of my other paper doll sets, printing out at about half the size of my usual 8 by 10 inch format. When I was little, I loved small paper dolls that I could tuck into an envelope or carry with me. Plus the smaller size makes it possible for me to include larger accessories like… maybe… a horse or something. Very cute. I’m already looking forward to more pages for this one! Thank, Omi Lynn. I’m enjoying drawing for them a lot more than I thought I would. Thanks – I was looking for paper dolls for my sponsored girls through Compassion Canada and I think these Poppet girls will be perfect. And they can color the clothes as well – I know I spent hours as a young girl making clothes for my paper dolls and coloring them. Hope they have as much fun doing them as I did.